Savory meat pies have been everyday fare in Britain since the early Middle Ages. The original, hard-shelled stew-filled pasty was easy to carry along to the mines. But the outside crust wasn’t even intended to be edible at first. By the Elizabethan era, after the introduction of the potato into the British Isles, a corollary of the British meat pie arose. 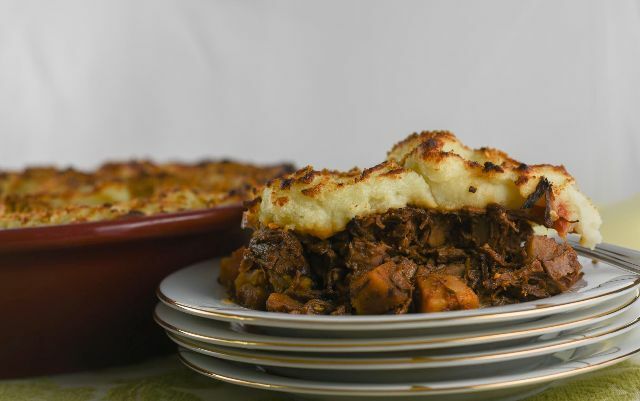 Simple potato-covered pies—like shepherd’s pie made with mutton and lamb, and cottage pie, chock full of beef—became common and have remained so. Cumberland pie is a variant that doesn’t get as much notice. It is not only delicious, but it is a great way to use cooked meat. There are as many recipes for all these potato-topped pies as there are cooks, so finding an “original” recipe is all but impossible. Some recipes harken back to the Tudor era, with its mincemeat pies, meat pies flavored with sweet dried fruits and warm spices and flavorings such as saffron and candied citrus peels. 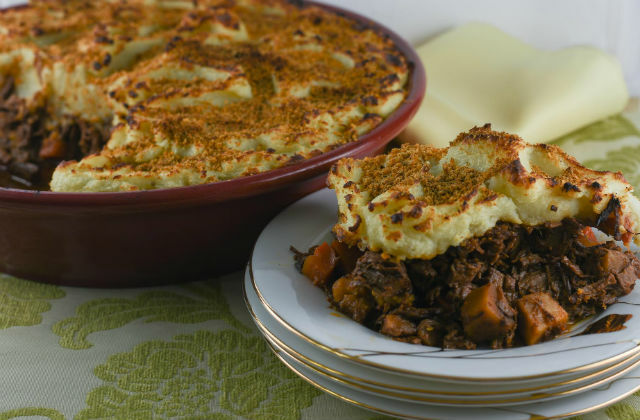 In general though, shepherd’s pies tend to contain peas and legumes, while cottage pie, which seems to be a bit older, is simpler, with just a few root vegetables, chopped meat and plenty of sauce. Cumberland pie is likely a variant of the cottage pie. Early recipes for Cumberland pie often include butter-rich mashed potatoes and occasionally there is cheddar cheese in the potato mix. With the accessibility of so many pareve milk-style products—from almond and cashew to soy or oat—creamy potatoes are now easy for kosher cooks. But what sets Cumberland pie apart is the crunchy topping, often a broiled top with plenty of toasted breadcrumbs. When I lived outside of London in the 1980s, I ate more than my fair share of butter and cucumber sandwiches on pullman loaves, and fried egg and potatoes. But British food has undergone a renaissance, in much the same way that American food has. My Cumberland pie is slowly braised at a low temperature with sweet wine. 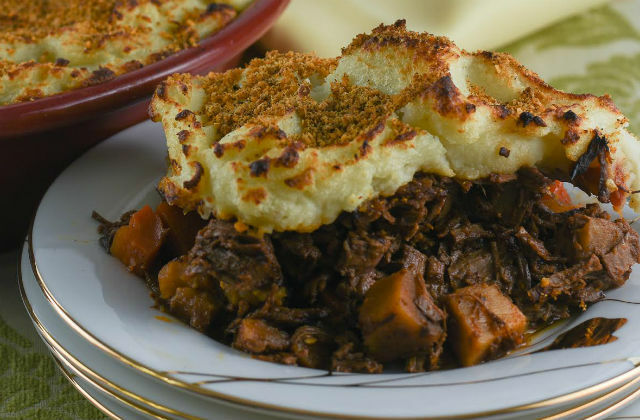 The parsnips in the stew are what gives it a decidedly Anglo-Ashkenazi spin. The recipe is easy to make in parts—perfect for Seder fare. The meat should be made at least a day in advance, but it can be made up to five days ahead. The potatoes can be made the day before. The day you are serving the pie, skim the brisket pot well and remove the meat and vegetables. Heat the sauce until it has reduced in volume enough to coat the back of a spoon. That nappe (as French chefs call it) will make the dish flavor-rich. Cover the pie with the potatoes, warm in the oven, top with the crusty topping and broil at the last minute. It’s a showy and fun dish, perfect for a crowd and anything but bland. This recipe is actually as easy as pie to make but fear not the long list of ingredients. You’ll have a memorably hearty and flavor-rich dish that is worth the time. Make the brisket: Preheat the oven to 285ºF. Gently sprinkle the brisket with salt and paprika on both sides and rub well to coat. Heat a large, heavy ovenproof saucepan or Dutch oven over high heat, pour in the oils, and heat until they shimmer. Carefully place the brisket into the pan and sear for 2 minutes on each side. Transfer to a rimmed sheet pan and set aside. Reserve the saucepan. Add the tomato paste to the pan and stir well to toast for 45 seconds to 1 minute. Add the leeks, stir to coat, and cook for 2 minutes, or until the leeks just begin to soften. Add the wine and mushroom broth and stir well. Bring to a boil and reduce the heat to a simmer. Add the stock and stir well. Carefully return the brisket to the pot, and add the carrots, parsnips, turnips, and bay leaves. Cover the pot and place in the oven. Cook for 3 hours. Refrigerate, covered, for 2 to 3 days. When you are ready to continue with the recipe, make the mashed potatoes: Fill a large pot with cold water and salt well. Add the potatoes and bring to a boil over high heat. Cook until the potatoes are fork tender, about 30 minutes. Drain the potatoes and push them through a ricer into a large bowl. Add the margarine and 2 tablespoons extra-virgin olive oil and mash until melted. Add almond milk and mix well. Season with 1 teaspoon salt. While the potatoes are cooking, skim the layer of fat and accumulated scum from the surface of the brisket pot and discard. Remove the meat from the pot, shred and then chop it before covering with foil. Set aside. Transfer the carrots, parsnips, and turnips to a work surface, reserving the pot. Cut the vegetables into ½-inch pieces. Set the pot over medium heat and cook the sauce until it is reduced in volume by half, about 10 minutes. Strain the sauce through a fine-mesh strainer and return to the pot. Return the brisket and vegetables to the pot and stir well. Cover and reduce the heat to a simmer. Spray a 2½- to 3-quart round oven-proof casserole/serving dish with nonstick vegetable oil spray. Preheat the oven to 400ºF. Place the brisket and vegetable mixture into the prepared casserole dish. Cover with the mashed potatoes. Bake until heated through and the mashed potatoes just begin to turn golden, about 30 to 35 minutes. Heat the olive oil in a small skillet set over high heat until it shimmers. Add the matzo meal, paprika, and the remaining salt, stir well, and cook until the mixture turns a light brown. Sprinkle the seasoned crumbs liberally over the casserole and return it to the oven. Bake for an additional 5 to 6 minutes, until the matzo meal and potatoes are deep golden brown on top.